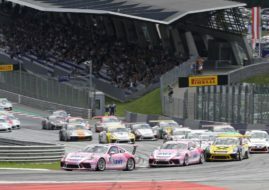 Michael Ammermüller sweeps the seventh round of the 2016 Porsche Carrera Cup Deutschland at Nurburgring. After winning Saturday’s race, which was his first PCCD victory this season, Ammermuller was again fastest in Sunday’s race. He won ahead Jeffrey Schmidt, who started from pole and remained in the lead until Lap 6. Ammermuller took the lead on Lap 7 and stayed in front for remaining 16 laps. Nick Foster made a significant progress from sixth place on the starting grid to the last podium spot. He fought against Nick Yelloly and Christian Engelhart, who finished fourth and fifth respectively. Like in the Saturday’s race, Sven Muller started from the back of the grid and progressed for ten places, to finish sixth at the end.